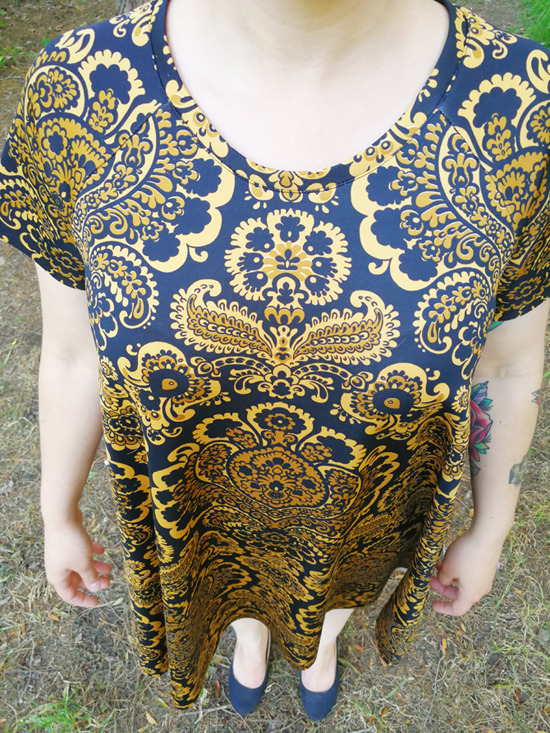 Are you ready to see the quickest dress I have ever made? Yeah, it's another Ebony. Yeah, I love the scuba fabric that Britex gave me. Yeah, I did a good job of lining up the print, but didn't take into account where the print would land... Oops. Whatever, still love this dress and will wear it nonstop! While this dress is made from the Ebony pattern it is a mix between the dress (View A) and the tunic View C), so I will call this "View D." It has the raglan sleeves paired with the length of the dress and it is a 90% rip off of Heather's beautiful scuba version. Imitation is the sincerest form of flattery or just call me "Copy Cat Erin." 😆 Ok, I didn't completely copy her (which is why I deducted 10% from the number above) because I didn't attach the neckband the same way she did and followed the instructions from the pattern, while she did more of a binding style neckband. 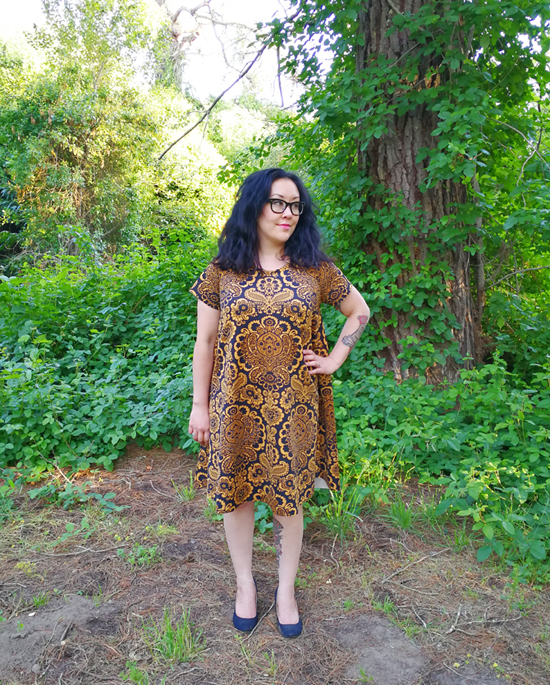 I don't have a ton to say about the project, as I just blogged about the other Ebony shirts I made in a blog post several weeks ago, but if you would like to see how I merged the two pattern pieces together you can check that out over on the Britex blog. Honestly, tracing the new pattern pieces was the most time consuming part of this sewing project. 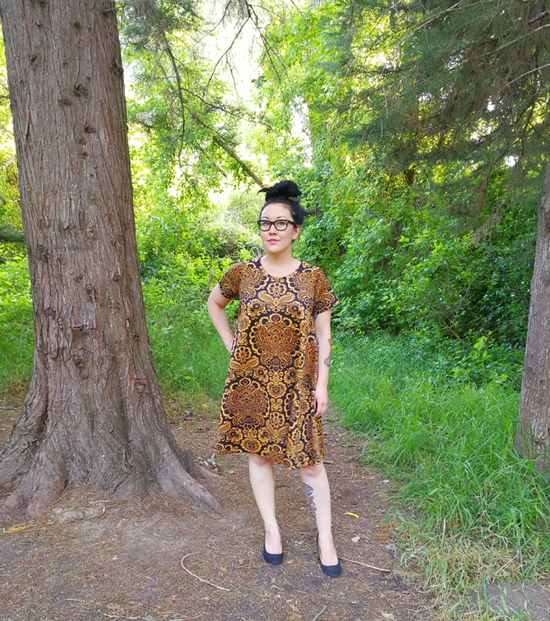 It was a very quick and easy sew that ended up being a sophisticated dress imho. But that's what a nice fabric can do for you! A major upside to me was not hemming. For whatever reason I dread hemming. I think it's because it's the last step before finishing a garment and it seems like it's keeping me from the finish line. Idk. But what I do know is that I don't particularly enjoy it. The cool thing about scuba is that it doesn't fray and therefore doesn't have to be hemmed! 🎉🎈! 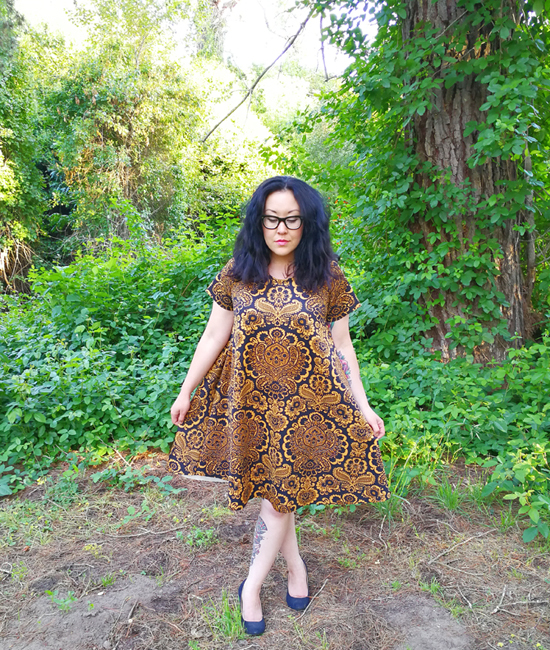 No hemming = an even faster dress. 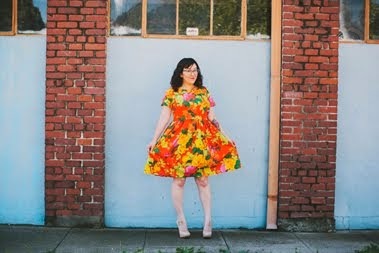 It's funny that I made this during Me Made May because I have been going so hard on wearing separates, but a girl has to treat herself to making a cute dress every once in a while 💁 So shout out to my sister, Kelly, for taking the photos, to Britex for the fabric, and to my closet because it just got cooler with this dress in it. Now back to my regular scheduled life of sewing separates.